We look forward to meeting you at the Atlantic Coast Veterinary Convention in Atlantic City. If you work in a veterinary office, clinic, or hospital you know how much phone traffic exists each day. Research indicates that over 70% of callers are placed on hold. What is your veterinary office doing with this opportunity? This is where an on-hold marketing system makes all the difference, and the right on-hold company will drive sales! A well-crafted on old program from Telephone On Hold means your valued staff will spend less time answering the phones, and more time caring for Fido and Fluffy. An on hold message from Telephone On Hold will increase your business. People love their pets and want nothing but the best for them. The on-hold message is the customer’s first impression of your veterinary office, the services that you offer, the technology you have available, and recommended preventative treatments that your office provides. If you show your clients that they have called a warm, caring environment with a qualified staff, your customers will feel good about trusting you with their four-legged friends. And, they're likely to tell a friend or two. Our on-hold marketing service (in place in veterinary clinics, hospitals, and grooming centers nationwide) will also prompt callers to inquire about lesser-known services and available products. Describe your specialties such as internal medicine, therapeutic laser, or toxicology. When are your offices open, and how do they reach you outside of practice hours? Why should a client choose you? Offer client testimonials, mention your client referral services. How will your clients benefit from choosing you? Promote your rapid diagnostics on the road and in the hospital. Call to learn more about the Veterinary On-Hold 866-359-4653. The right on hold message will increase your business. People love their pets and want nothing but the best for them. The on hold message is the customer’s first impression of your veterinary office, the services that you offer, the technology you have available, and recommended preventative treatments that your office provides. If you show your clients that they have called a warm, caring environment with a qualified staff, your customers will feel good about trusting you with their four-legged friends. And, they're likely to tell a friend or two. 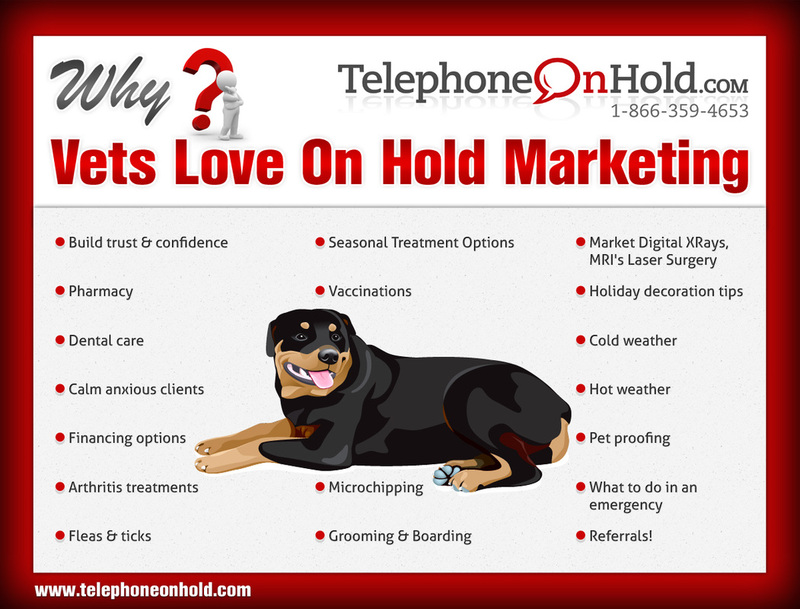 Our on-hold marketing service (in place in veterinary clinics, hospitals, and grooming centers nationwide) will also prompt callers to inquire about lesser-known services and available products. Tell patients about your doctor(s) background or hobbies. Educate callers about your lesser known services such as boarding or grooming. Hear on hold demos and view a full presentation by visiting OnHold.com's veterinary music on hold messaging page. Click here to view our comprehensive veterinary presentation (PDF). Call to learn more about the Veterinary On-Hold 866-359-4653. Remind callers of the danger in leaving their family pets outside in cold temperatures. Urge callers to use pet-safe ice melt. Instruct callers about your afterhours services. Inform callers about the hazards associated with the holiday season – pets escaping (perfect time to mention microchipping their pet), dangerous plants, unsafe foods. Inform callers that, though they may celebrate Easter, chocolate, candy and even lilies can be dangerous for their pets. Remind callers to be sure their pets are up-to-date on their flea, tick, and worming medications. Inform callers about grooming and shearing services. Remind callers to schedule their pet’s yearly checkup. Educate callers about keeping pets safe in the hot months – never leave them in vehicles, keep them well hydrated. Although it may be fun for callers to bring their pups along on a car ride, they should be secured in proper seatbelt harnesses or crates. Inform callers to discuss clipping or shaving dogs with long coats. Take precautions to keep pets away from gardening chemicals. "Capital City Spay & Neuter is extremely satisfied with the professionalism and expertise exhibited by Telephone On Hold's team - especially, Justin and Louanne. Telephone On Hold is a great investment for our veterinary practice and we have received many positive comments from customers. We would recommend Telephone On Hold to any company who is looking for excellence and professionalism and customer service." Telephone On Hold is a great outfit. Efficient, quick, quality production and fair price! Who says you can't have quality, price and time all in one? Trusted by veterinary hospitals, clinics and grooming center across the country. Call today! We learn about your veterinary office via a comprehensive phone interview and by visiting your website. We work with vets across the country and will put that experience to work for you. Our creative department will write a custom script (approx. 750 words) for you to review and approve. This will include office technology, emergency care, seasonal messaging, pharmacy options and doctor(s) background and training.